Home Unlabelled Kyrie Irving Went Days Without to Teammates During Postseason?? Kyrie Irving Went Days Without to Teammates During Postseason?? few weeks ago, Kyrie Irving made some pretty enormous headlines after a report came out that he asked the Cavaliers' front office for a trade. And, as you likely know, since then we've seen a number of follow-up reports that are good news for fans of competitive balance (in the East, anyway) and bad news for Cavs fans (though it's worth pointing out that he's still on the roster andis signed for three more seasons. He can't just leave because he's unhappy). 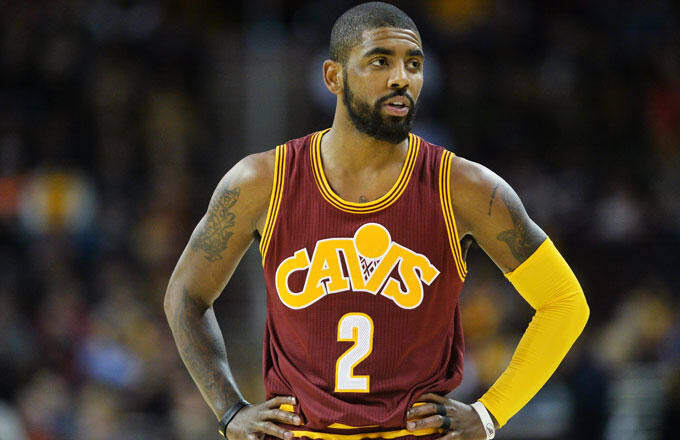 Still, according to a new report, Irving was mentally checked out long before he approached Dan Gilbert to send him to another franchise so he could step out of LeBron James's shadow and be more of a focal point. Appearing on the B-Ball Breakdown podcast, ESPN NBA reporter Dave McMenamin said that Irving went consecutive days without speaking to teammates between the first and second rounds of this past year's playoffs. "I'm not sure. Phoenix, of course, hired James Jones this offseason. He's been inside that locker room. He saw Kyrie in the playoffs this year—in between the first round when they beat Indiana and the second round when they played Toronto—go consecutive days without speaking to a teammate at practice. On that stage. "It's one thing for people to go through your ups and downs during the regular season. But when you get to the playoffs, the main thing is the main thing, and we're brothers, and we're pulling together to get this thing done. Even at that level, there were things that made him sullen or reclusive from his teammates." Despite that apparent drama, the Cavs still swept the Pacers and Raptors in rounds 1 and 2, respectively.